Success one year ago in Antibes at the quarter-final stage when beating Romania’s Daniela Monteiro Dodean in four straight games, one year later in Montreux, for Austria’s Liu Jia it was victory once again when facing the Romanian. 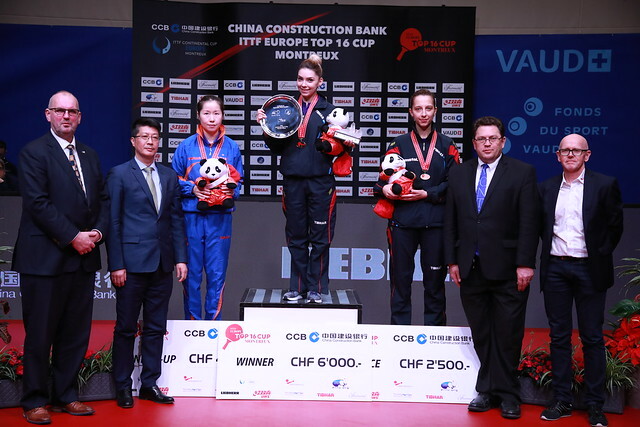 However, it was somewhat of a more testing experience than in the Côte d’Azur; in the opening round of the Women’s Singles event at the China Construction Bank 2018 ITTF Europe Top 16 Cup on Saturday 3rd February, Liu Jia, the no.7 seed, emerged successful in six games when confronting the no.15 seed (5-11, 11-4, 11-8, 8-11, 11-5, 11-6). A repeat success but also it was a debt settled; later in the year at the Liebherr 2017 World Championships in Düsseldorf, Daniela Monteiro Dodean had been the winner. Defeat for Romania but there was success, hard fought success; Elizabeta Samara, the no.3 seed, eventually overcame Luxembourg’s Ni Xia Lian, the no.11 but she needed the full seven games to ensure victory (11-9, 14-12, 9-11, 11-7, 8-11, 5-11, 11-5). Success for Elizabeta Samara and a second success in recent times, Elizabeta Samara had beaten Ni Xia Lian at the Liebherr 2017 European Team Championships in Luxembourg. Results as status advised but that was not the situation as the opening round of the Men’s Singles event advanced. Denmark’s Jonathan Groth, the no.8 seed, beat Portugal’s Tiago Apolonia, the no.11 seed (11-5, 11-9, 11-8, 7-11, 11-7) but there was a shock in store for Ukraine’s Kou Lei, the no.7 seed. He was beaten by Panagiotis Gionis of Greece, the no.15 seed (11-13, 8-11, 17-15, 7-11, 11-8, 12-10, 11-5). Success for Panagiotis Gionis and a reversal of fortunes; three years ago at the 2015 European Games in Baku, Kou Lei had prevailed in six games.